I first heard 'Whole lotta love' as part of a top 100 of all times somewhere in the Eighties. It was a fascinating rock track and although I usually don't really like guitar-based tracks, this was one big exception. 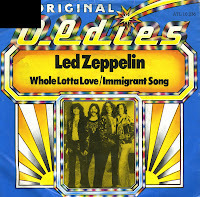 Led Zeppelin recorded 'Whole lotta love' in 1969. According to Jimmy Page, 'It was put together when we were rehearsing some music for the second album. I had a riff, everyone was at my house, and we kicked it from there.' The single reached number 4 in the Dutch Top 40 in 1969. In the UK, the track only hit the charts in 1997, when it reached number 21 during a two week chart run. The main guitar riff was subsequently used for the leader of the popular UK TV programme 'Top of the pops'.